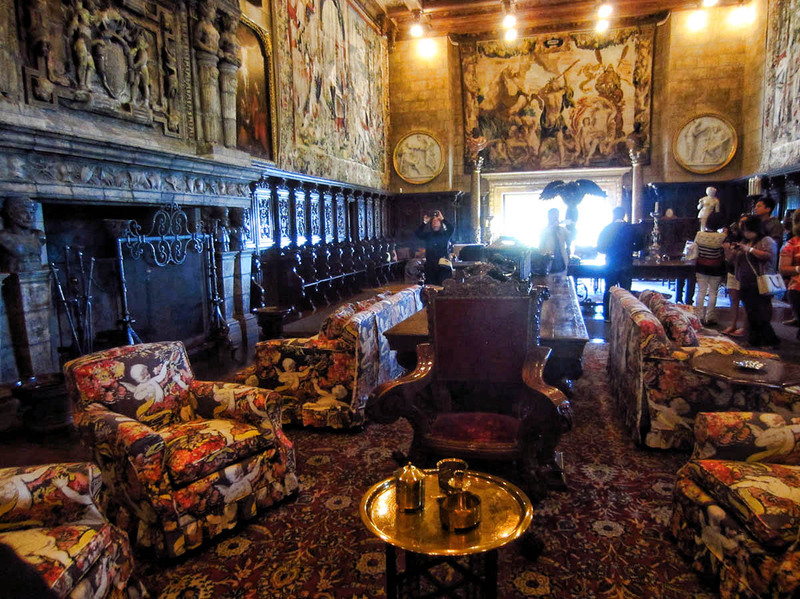 Yet another reason for my road trip, I had booked space in San Simeon State Park far in advance to be guaranteed of a place to park for Memorial Day Weekend. Had I cancelled that space due to the Winnie repairs, I would have lost both booking fees and cancellation penalties, consuming the majority of the refund. Since the reservation was for the “primitive” campground (Washburn, dry camping on the grass with no hook-ups,) I figured I could get by with pitching my tent there. That tiny blob at the top of the hill is Hearst Castle, where zebras still roam from the days it had its own zoo. 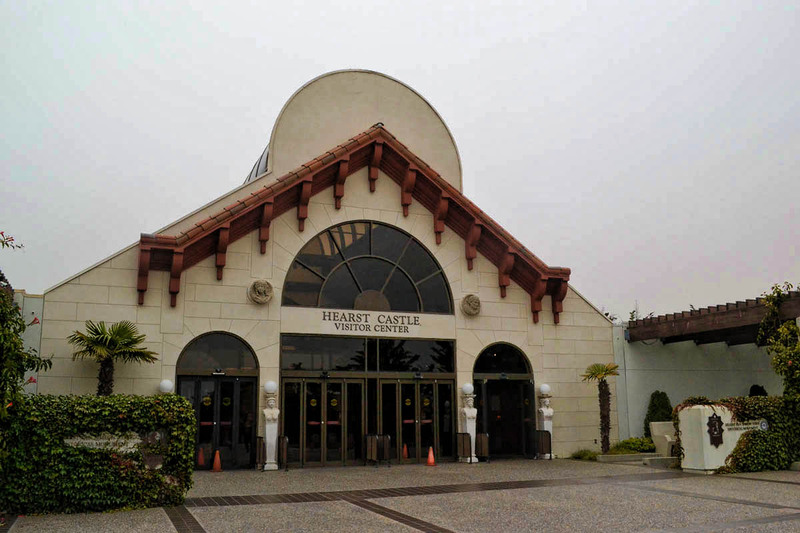 The Visitor’s Center is at the bottom of the hill, often shrouded by marine layer. 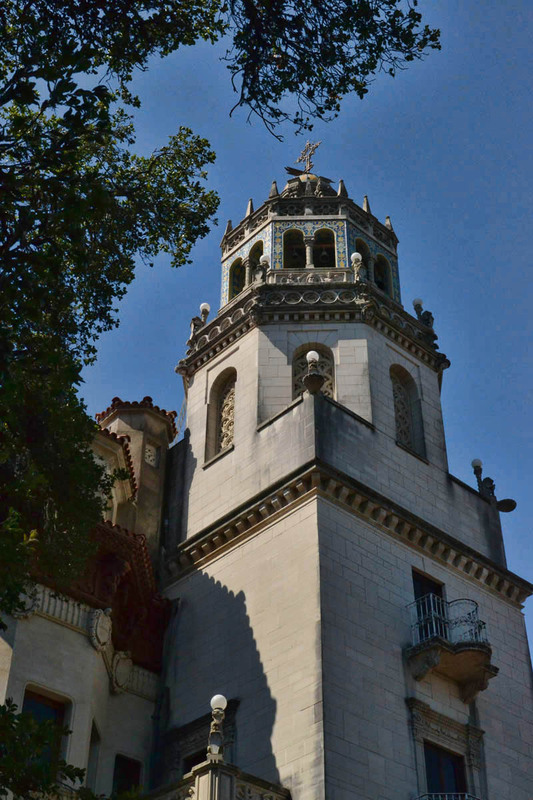 Casa Grande was designed after a church in Ronda, Spain. The back side of the Castle, or Casa Grande. Side view. Note beautiful wood carving near top. Also contributing to my interest in the Hearst family was my stint much later in life as National Account Manager with American Express. Hearst Publications was one of my accounts. I always wanted to see the wellspring from which this behemoth corporation originated, from his very first magazine, Motor, to the Big “O” herself, Oprah’s O Magazine. This view should overlook the ocean, except for the coastline is still shrouded in fog at this early hour. 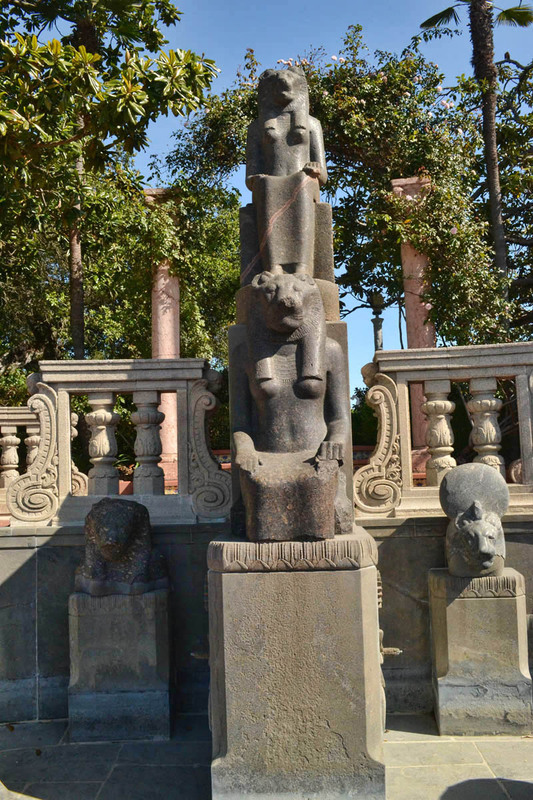 The oldest sculptures on the grounds, Four Egyptian sculptures of the lion-faced goddess Sekhmet, 3,500 years old. 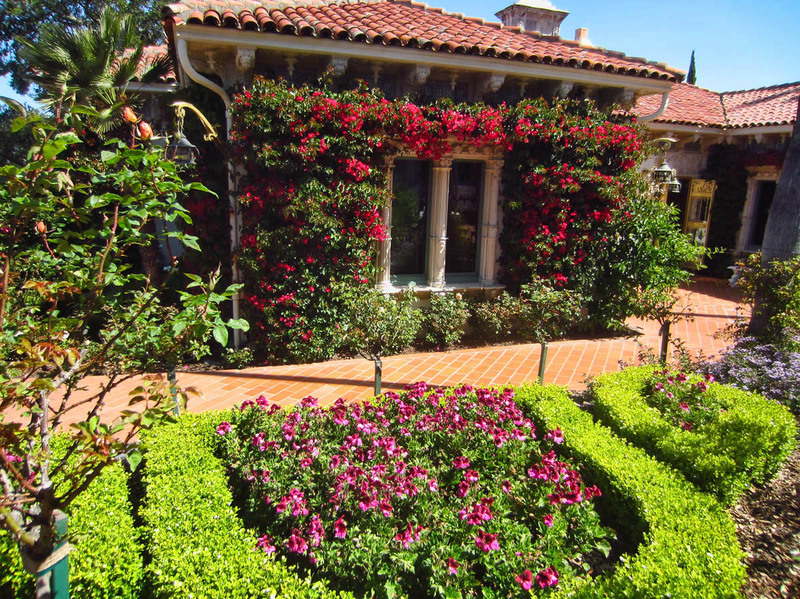 One of the three guest cottages, named Casa del Sol, Casa del Monte, and Casa del Mar. 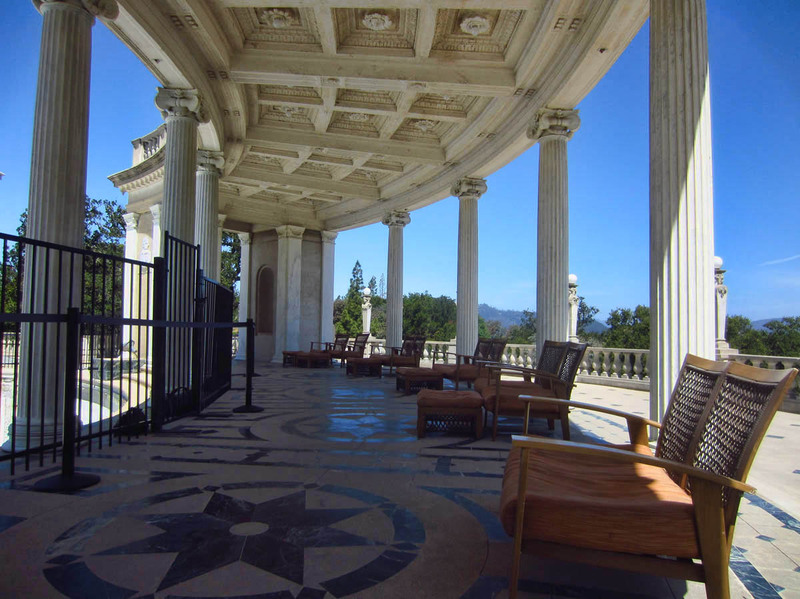 Enclosed balcony on the smaller mansion. Another of the three guest cottages. 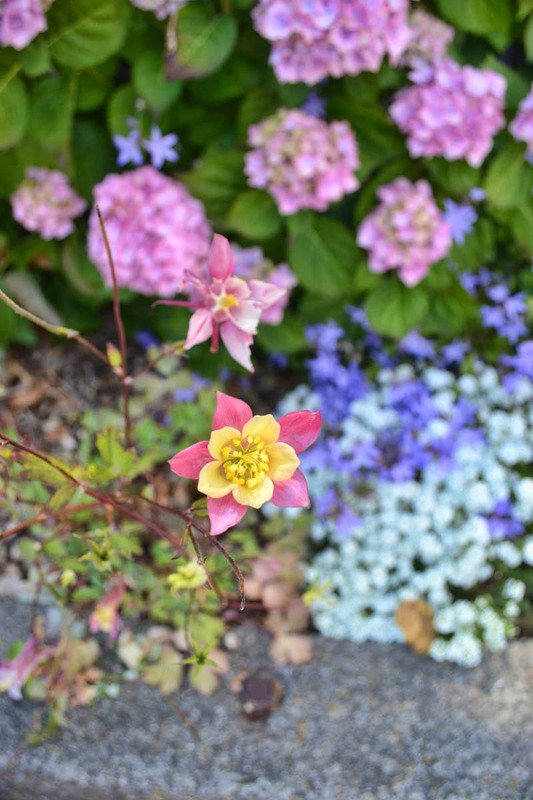 “Swan Pink and Yellow Columbine.” The perfectly manicured gardens are almost as beautiful as the Castle itself. Our tour guide tells of the elaborate, 5,000+ piece art collection. 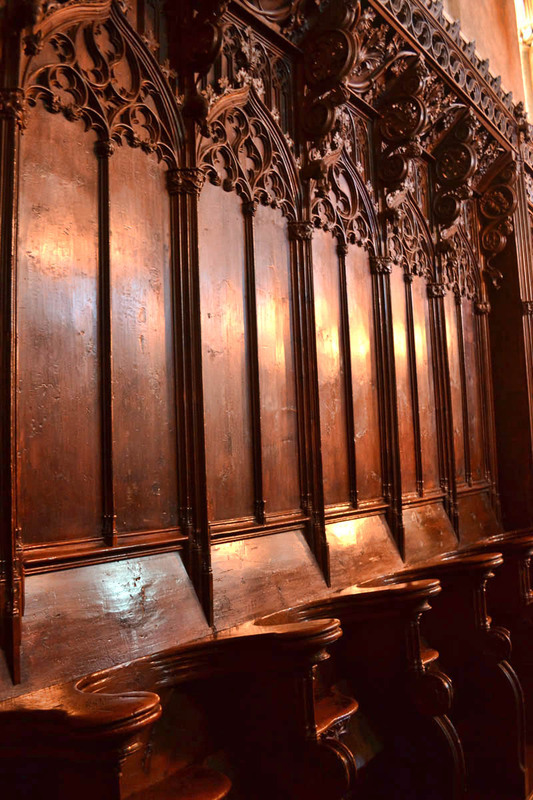 Imported Choir Stalls were used as paneling. 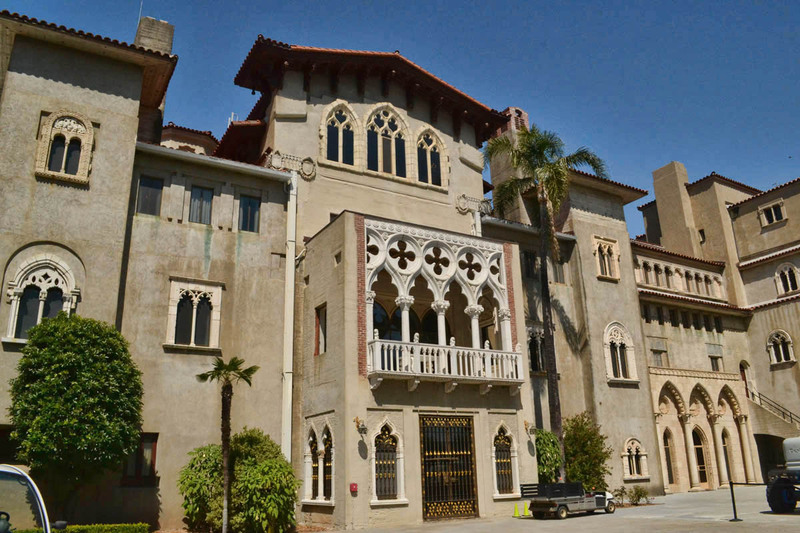 While the Hearst Compound is referred to as a “castle,” it’s actually a group of one large and three smaller mansions. 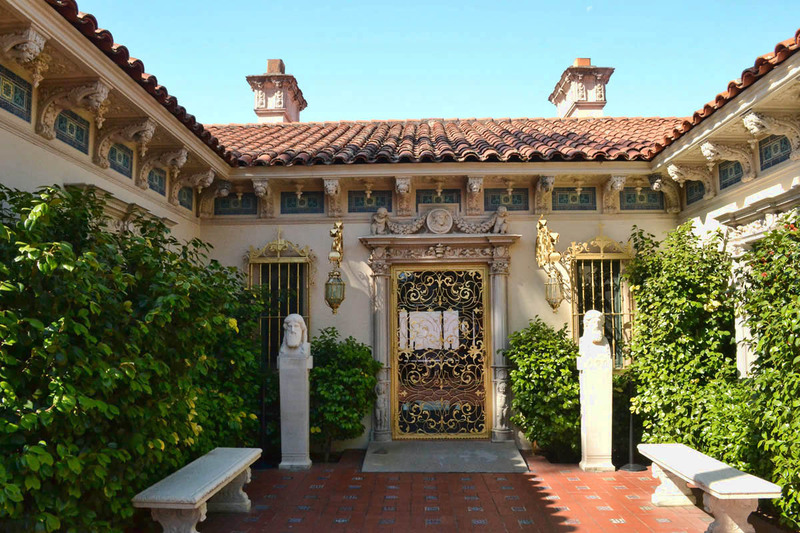 Hearst, along with his mistress the famed actress Marion Davies, occupied the main house, a 68,500 sq ft “Casa Grande” with 38 bedrooms, while famous guests had their own “guest cottage” to choose from, one of three smaller mansions with four to eight bedrooms. 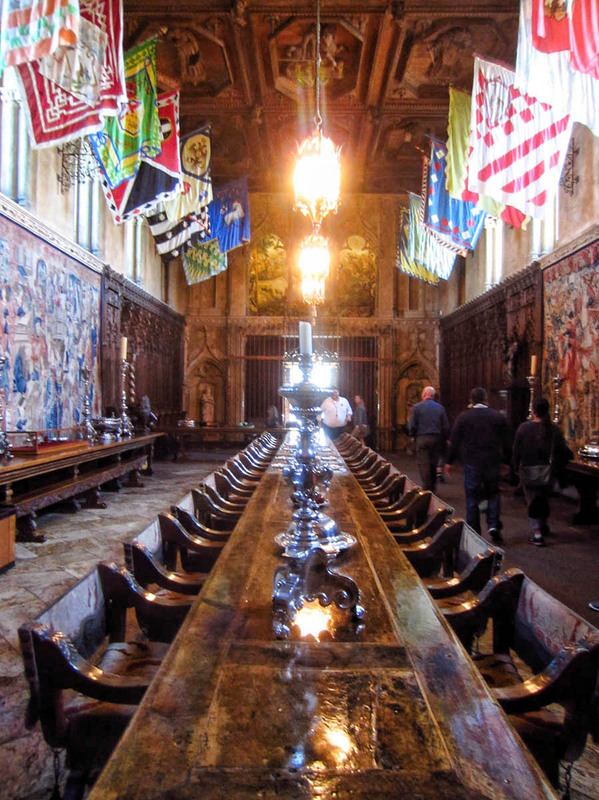 Massive dining hall has elaborate carved ceiling. 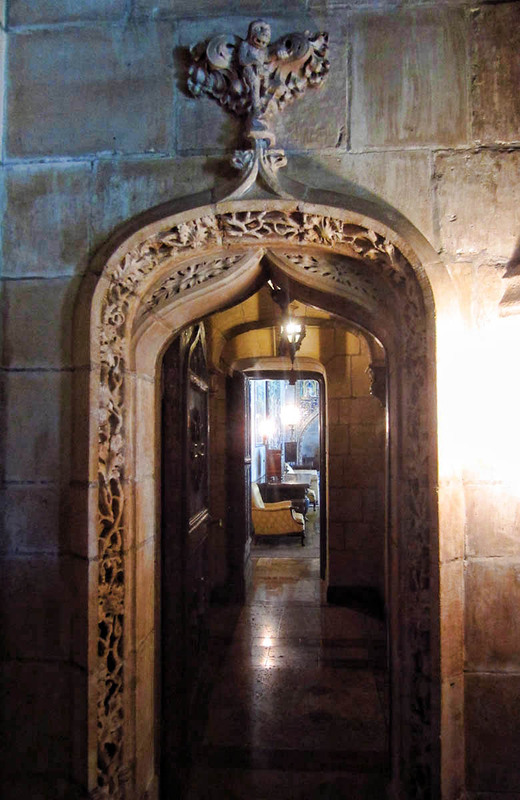 “Castle-like” doorways make me think of that castle to the east, Biltmore House. 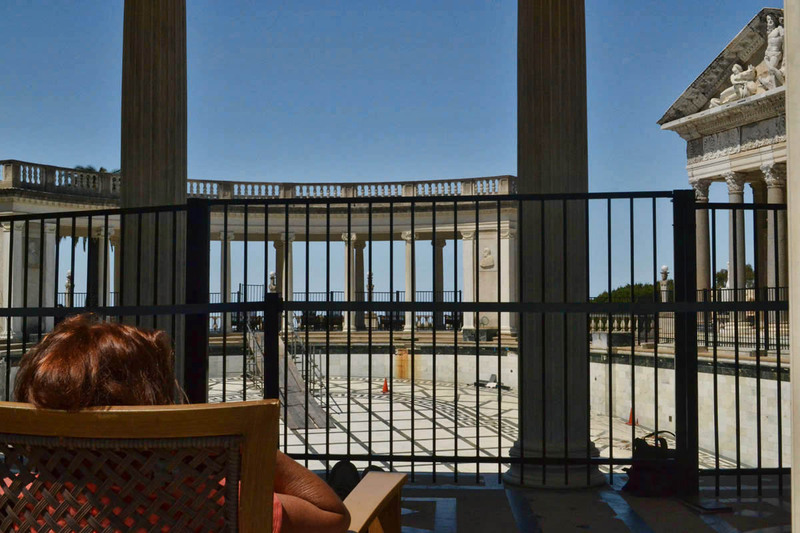 I am most eager to see the iconic Neptune Pool. 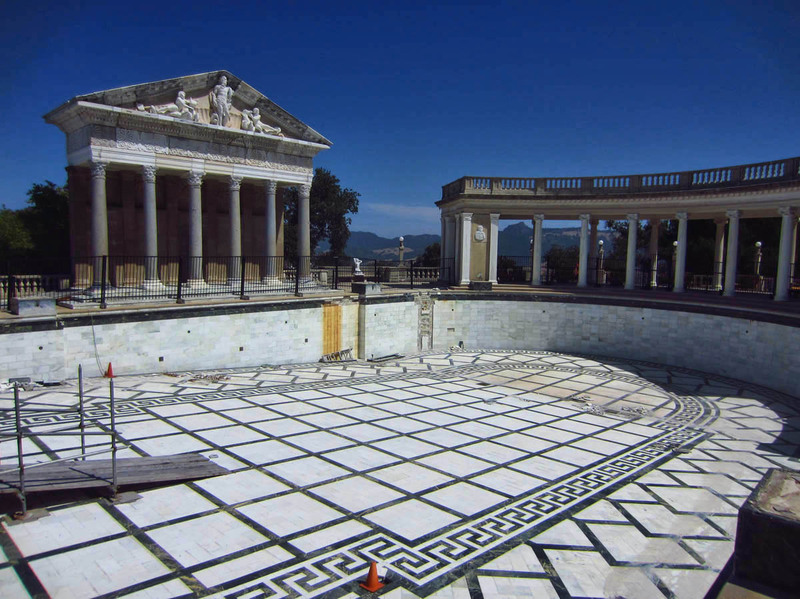 Had I actually done any research before arriving, I would have been prepared for the shock and disappointment of seeing the typically aquamarine-filled, refreshing pool of water surrounded by gleaming marble statuary now empty, filled with ladders, scaffolding, and shards of marble. The 345,000 gallon pool the size of a football field has been leaking about 5,000 gallons a day, so in light of the recent California water crisis, the pool is closed for repairs and restoration. Still a marvel in classic Roman elegance, it leaves my thirst unquenched. 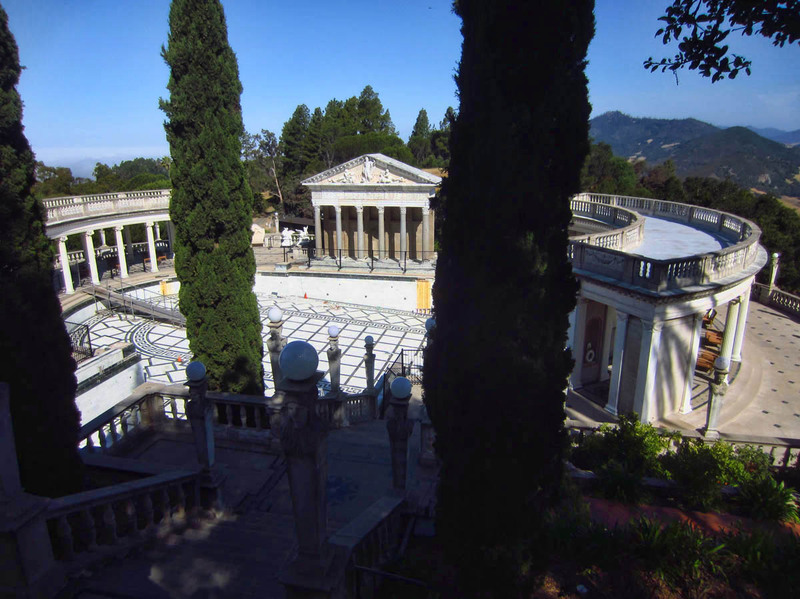 First view of the Neptune Pool (GASP!) It’s empty! Restoration project is expected to take another year. Guests are allowed to sit on the “modern” furniture. I could sit here all day! Imagining what it must have been like languishing beside the pool. Hopefully they weren’t kept out by a wrought iron fence! 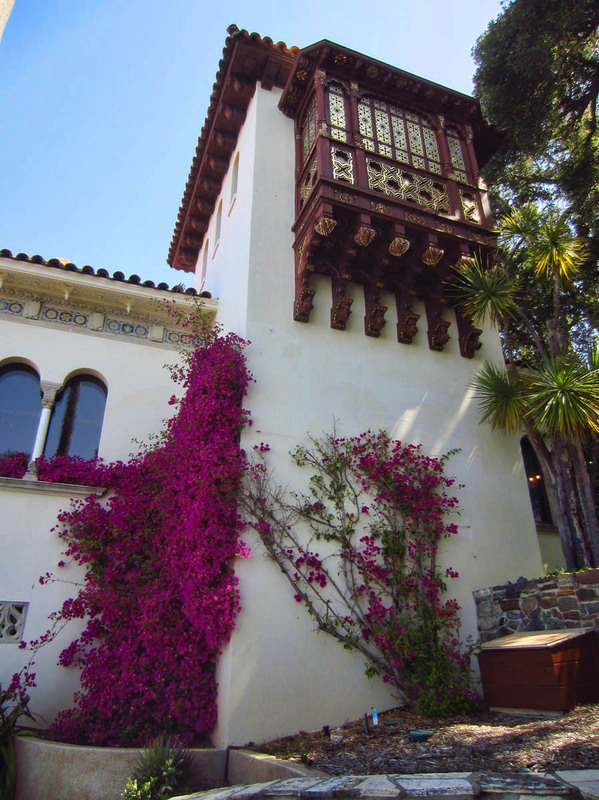 The “castle” was designed by architect Julia Morgan, one of the first women to receive a civil engineering degree from UC Berkeley. Quite a fete for a woman in the architectural field nowadays , much less back then. 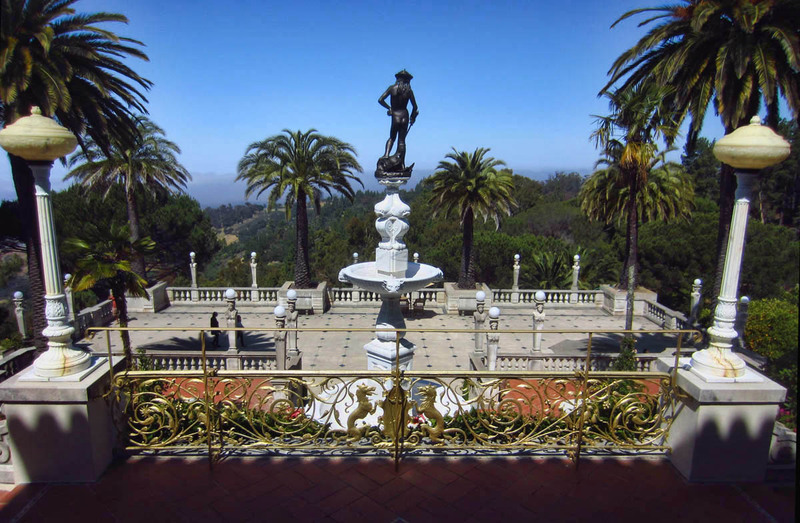 She and Hearst worked on the still unfinished project from 1919 until 1947. 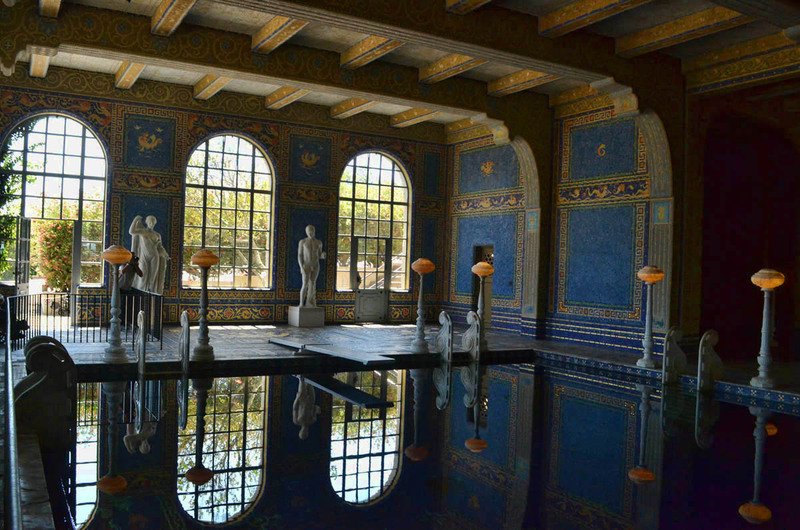 The smaller indoor pool referred to as the “Roman Pool” was modeled after the baths of ancient Rome. 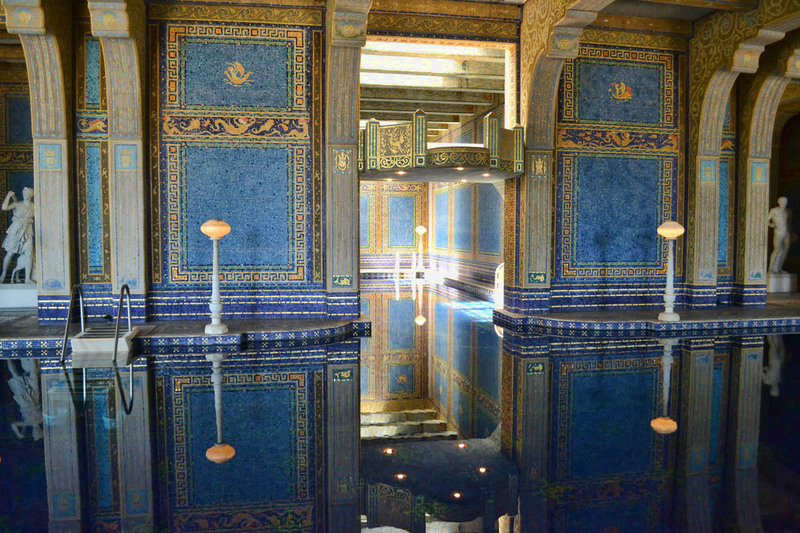 The 10 ft deep, 205,000 gallon pool is decorated from floor to ceiling with glass mosaic tiles. 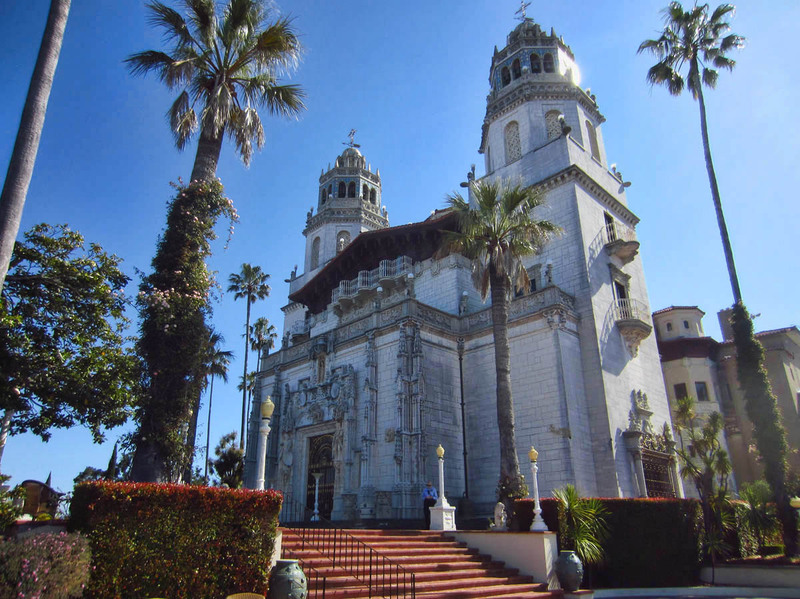 This entry was posted in California, State Parks and tagged Hearst Castle, San Simeon State Park by Suzanne. Bookmark the permalink. You are certainly making the best of a difficult situation, hope you are on the road soon. 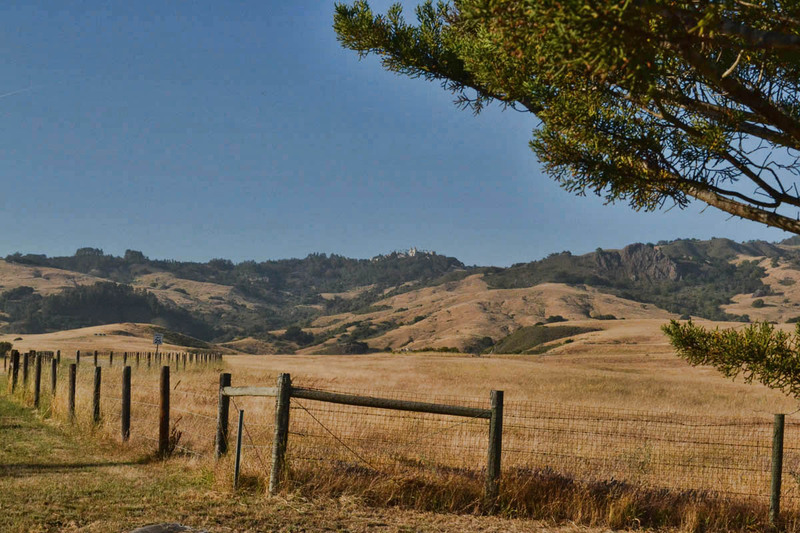 Great beaches as you return south, a stop at Nitt Witt Ridge is a bit of East Jesus in Cambria, not quite the opulence of the castle. Glad you asked about Patty, I had not heard the state has her cut out of the family tree, bet the family feels different. Wow, that place looks incredible! We are typically don’t hit tours like this but I think we would do this one. Thanks for sharing! 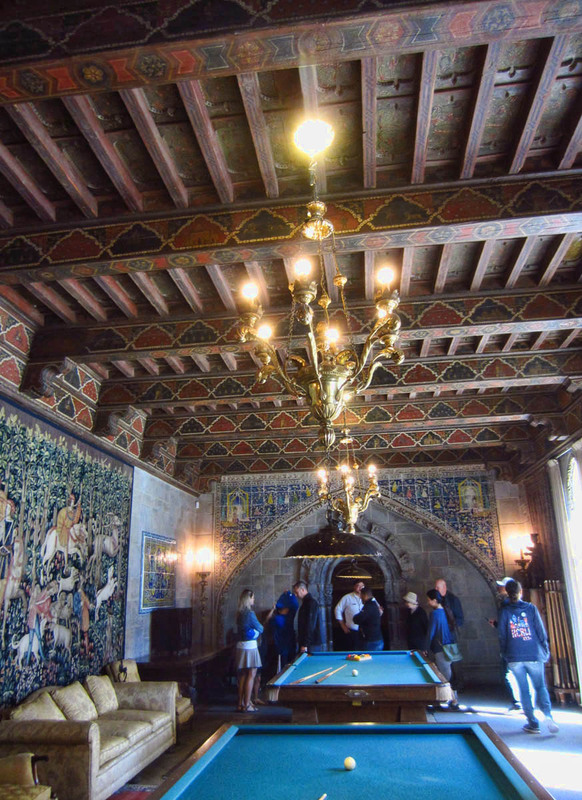 I remember touring the “castle” long ago and being entranced by it all. Yet seeing your photos I am overwhelmed with all the clutter. Guess collecting things changes when you live in a RV. Glad you got to see it but don’t get how they can leave Patty out of their story. 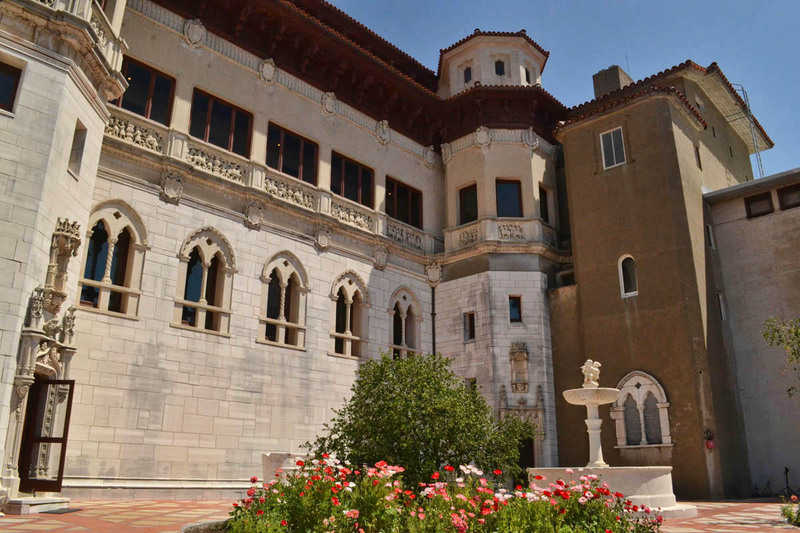 In the 1930’s Hearst also owned St Donats Castle in the Vale of Glamorgan outside of Cardiff. 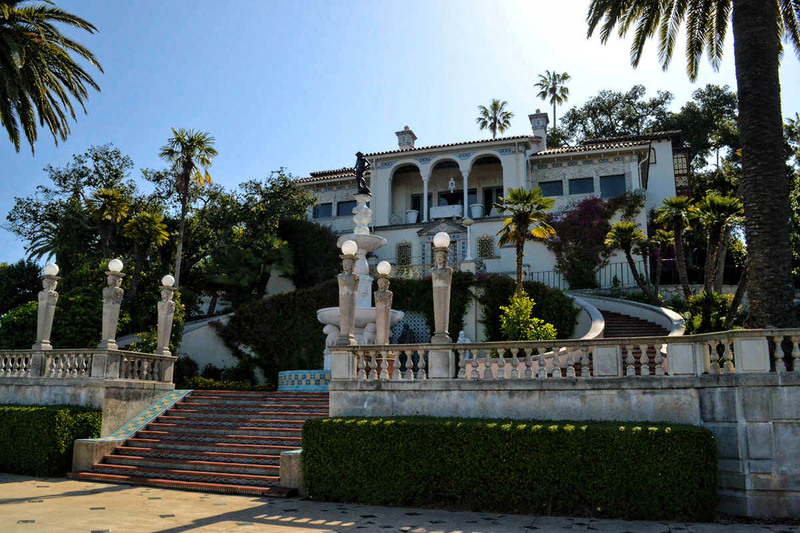 He bought it for his mistress Marion Davies and entertained many famous people there. He rebuilt some of it apparently with pieces plundered from other ancient buildings. It is now a school, Atlantic College. More here. It’s terrific that you have the paraphernalia to tent camp! I love how you are making the most of a difficult situation! Box Canyon Mark, Ouray, Colorado. 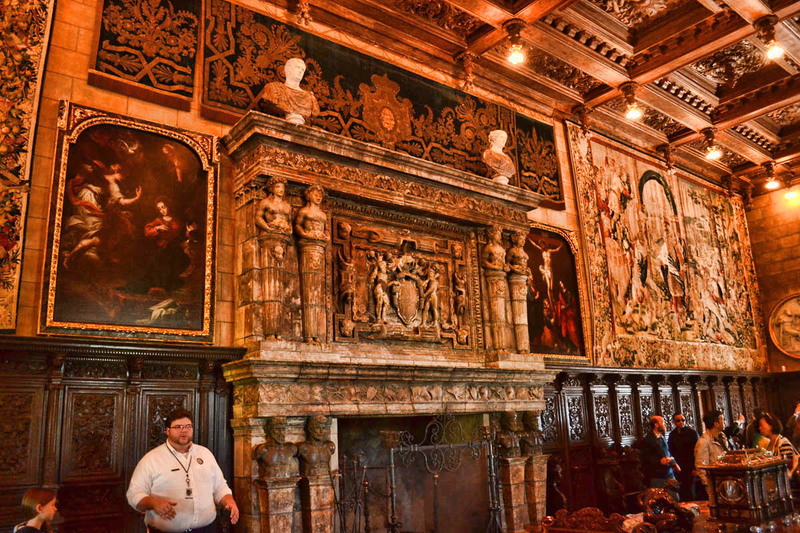 Great photos of the castle Suzanne. Supposedly my aunt took me there over 50 years ago, but since none of it looks familiar I’m thinking she lied and took me somewhere else….or maybe it’s one of those false memories on my part. I am so happy that you ‘have moved on’ for now and are still enjoying adventures on a daily basis. Great post, have never been and likely won’t thanks to your post. Poor Patty, does she even have a life these days. Hey, don’t forget to check out the wineries. Glad you had a nice tour of the Cuesta emcantada! Sorry we were taking care of family during your coastal jaunt. We could have helped you make Limoncelloo with all those lemons. One of my favorite moments at the castle was a “volunteer ” recognition party IN the Neptune pool! It was magical. I hope that by now your own magic carpet is ready for the next adventure… And you are headed to yoir next playground! Fun jaunt up the coast for you. And maybe the next time you can go at the slow crawl pace. Have safe travels going north! 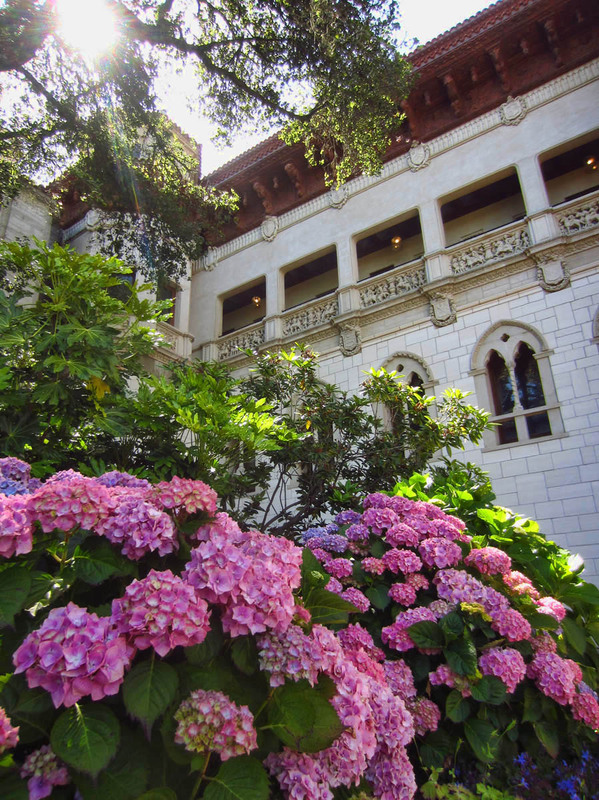 I have always wanted to see Hearst Castle but not sure that I will get there so it was interesting seeing it through your eyes. You are definitely making the most of a difficult situation Suzanne. Hope life gets back to normal soon (whatever normal is). 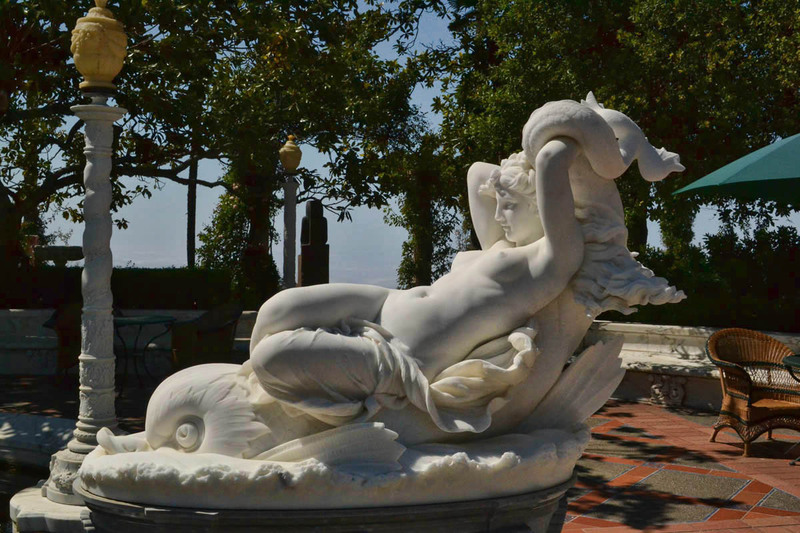 My darling wife and I toured Hearst Castle in the spring of ’14. It is in every way a grand folly and we loved it. We put two tours into one day; the main house in the morning and the cottages, kitchens and wine cellar (Of course!) in the afternoon. A docent told us that the tours had become increasingly popular with the cosplay crowd, which must add simultaneous touches of authenticity and whimsy. 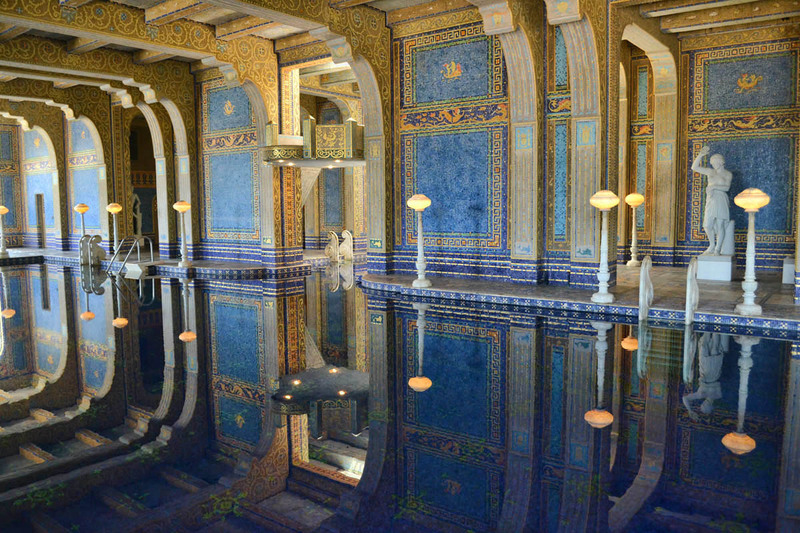 That beautiful pool, when restored, will still not be available for swimming. 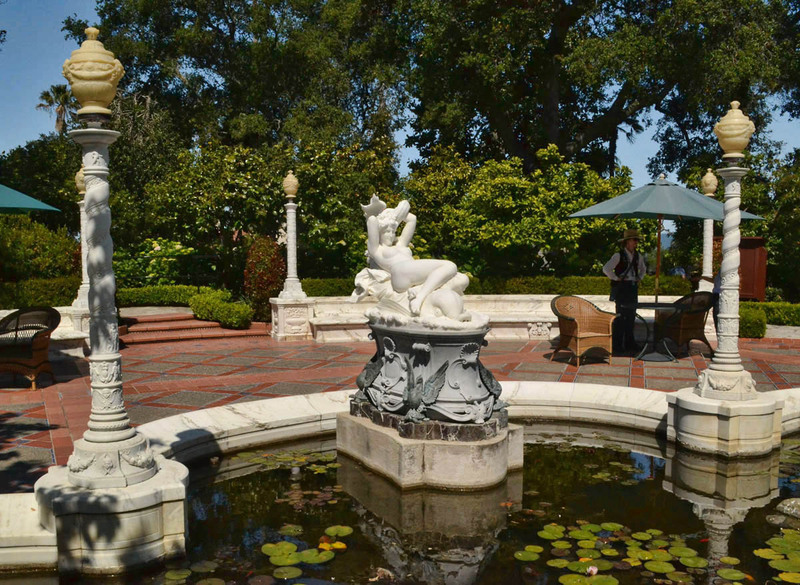 Docents and park employees used to be able to use the pool once/year in a grand employees’ party. No longer. 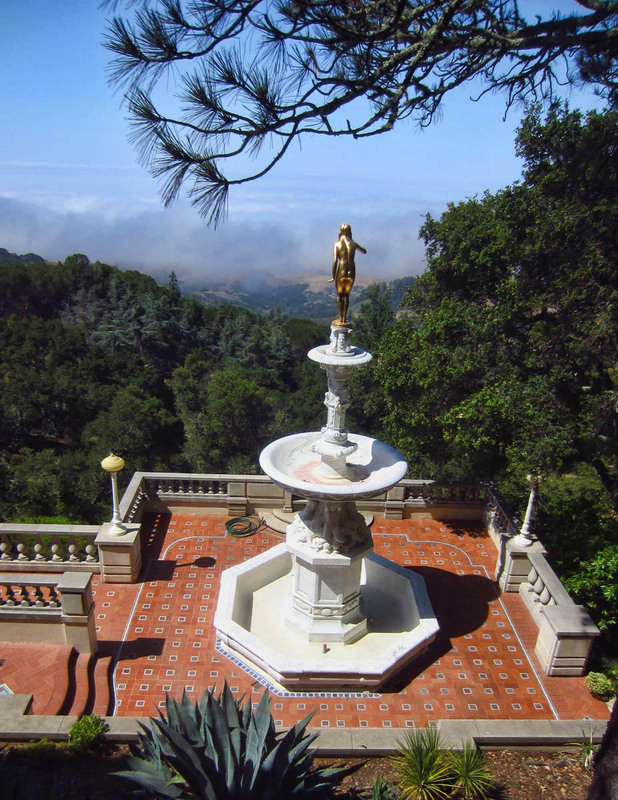 The draconian conservationists in the CA State Park Dept. killed that practice and it will not return; so we were told. I’m certain W. R. Hearst would not approve of the change.